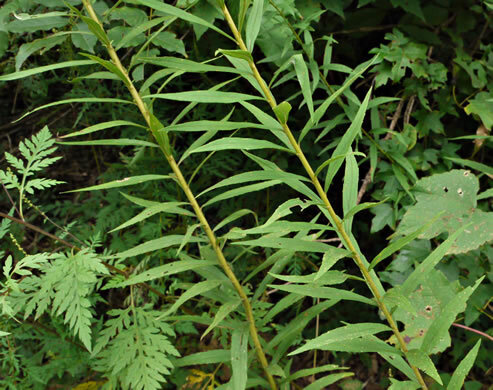 Forest Plants of the Southeast and Their Wildlife Uses p176? 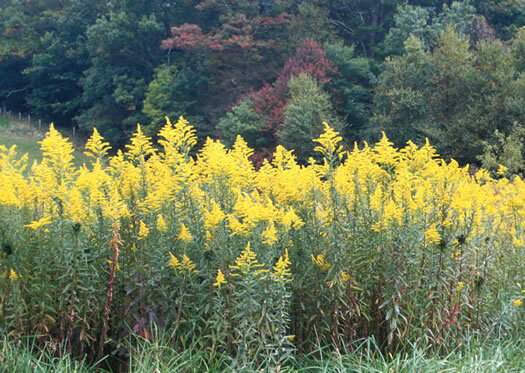 Wildflowers of Tennessee, the Ohio Valley, and the Southern Appalachians p380? 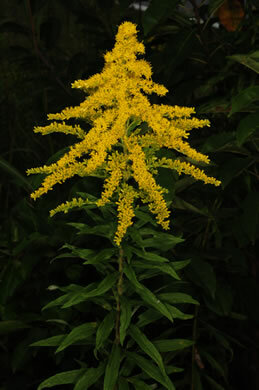 Wildflowers of the Southern Mountains p205? 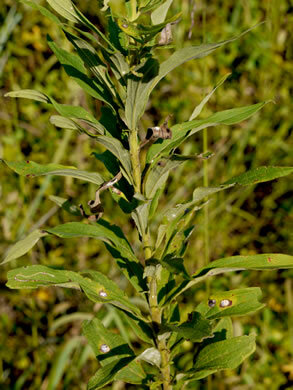 S. altissima is the goldenrod that usually has mid-to-upper stem ball galls, per Asterae Lab: Classification and illustrations of goldenrods (J.C. Semple). 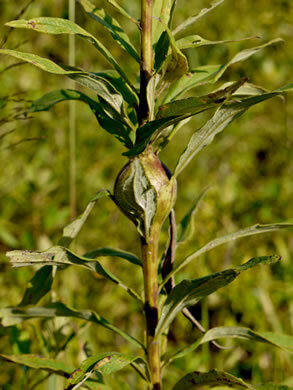 Short hairs can give fresh plants a gray-green tone not seen in S. canadensis, per Flora of North America. 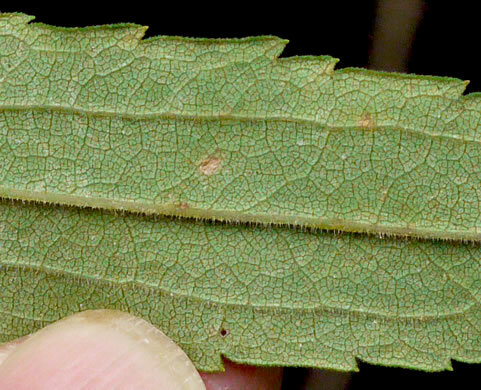 Mid-stem leaves entire to serrulate, per Weakley's Flora. 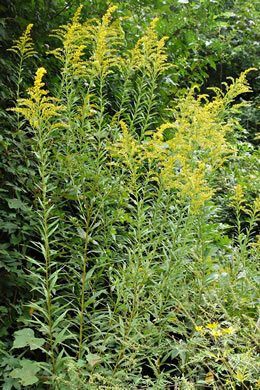 Distinguished by short-hairy pubescence on stems & leaves, upper lvs entire, per Asterae Lab: Classification and illustrations of goldenrods (J.C. Semple). 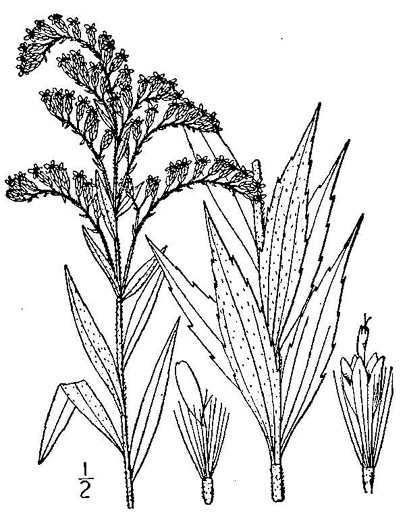 Leaves moderately to densely pubescent across the lower surface, per Weakley's Flora. 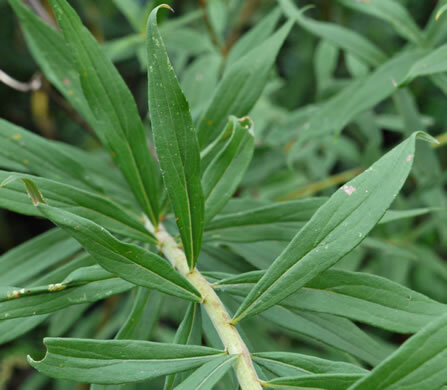 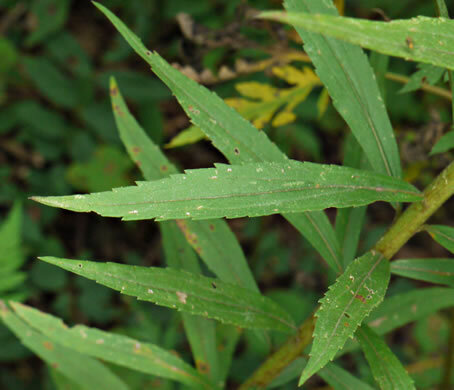 Upper stem leaves entire, thicker than the serrate upper lvs of S canadensis, per Asterae Lab: Classification and illustrations of goldenrods (J.C. Semple). 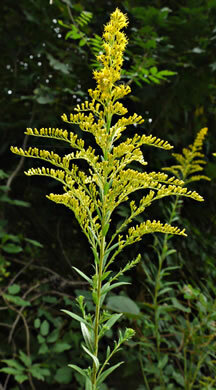 Flowers in an erect, broad, pyramid-shaped panicle, per Forest Plants of the Southeast and Their Wildlife Uses. 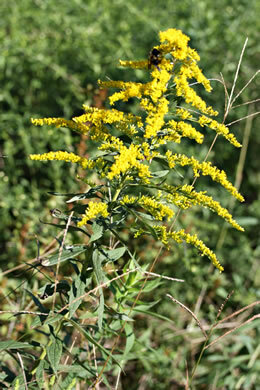 This is the most common goldenrod of the Great Plains & e. North America, per Asterae Lab: Classification and illustrations of goldenrods (J.C. Semple). 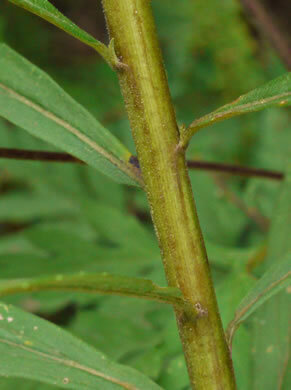 Stems are 0.8-2m tall from a creeping rhizome, forming colonies, per Forest Plants of the Southeast and Their Wildlife Uses.